This little phrase, which became popular among runners when the modern resurgence of long distance running began in the 1970’s, actually came from a short story written in 1959. It was the story of a poor English boy who used running to deal with the dismal life he had. Tom’s feeling lonely, let’s keep him company. Then I thought of Alberto Salazar, A Cuban-American professional and Olympic runner. Salazar was well known for his philosophy of running with injuries, running through injuries and ignoring injuries. He reckoned that if training for 120 miles a week produced certain results, then running for 180 or 200 miles a week would produce 50% better results. Well, sure enough, part way through the run, my left leg started aching and cramping. I thought to myself, this thinking about loneliness and extreme training is going to be the death of me this evening. I had struggled through the winter with an aching, nervy left leg. But I had gotten through that and this was a surprise. So I started trying all the things runners try when some part of their body is rebelling. We Christians pray about it. Hmm, that worked for a few minutes. Focus on the injury, give it attention and breathe into it. That actually works with stomach cramps. Not so much with legs. The thing about running is that you can always stop and walk. Mostly, you’re the only judge of yourself. I tried that briefly but it didn’t help. So then I’m thinking, “You know what if it’s a bad, bad injury sooner or later you’ll just take a step on your left foot, you’ll fall down and that would be that.” And if that happened, “It’s just pain and you’ll just feel what it’s like for now and then it will be over.” Then I had a novel thought; my right leg; in fact the whole right side of my body feels great. It’s really strong. That part of me is just going to take over and finish this run. And it did. It pulled my left side along, which felt like it was limping, but when I looked, my left stride just looked normal. Later I thought about the story in Matthew’s gospel that “if your right hand causes you to sin, cut it off and throw it away! It is much better for you to lose one of your limbs than to have your whole body go off to hell.” But that didn’t make any sense either. So there you go, you never know what will happen when you go running. Doesn’t it sound like fun! It was a nice rainy day today. In spite of which, I decided to go running at the Arboretum as planned. Although I was soaking wet by the time I came back to the car, I was really happy that I did it. There is something about being at peace in all of the natural world that we are blessed with. I felt it this day. It was running through mud puddles and not caring how it felt. Hey, boys will be boys. It was smelling the sweet blossoms of trees that were only in full bloom this one day. It was seeing a blue jay alight behind the tree as I ran by. It was seeing a flock of robins spread out on the grasses of the meadow. As Henry Thoreau was quoted, while sitting in the rain, “Every little pine needle expanded and swelled with sympathy and befriended me.” I was so glad that I went out running in the rain today. And I would be glad for your company next Thursday 5:15 at the Arboretum sculpture garden. I believe it is going to be a good day for running. To foster greater appreciation of running among young people in our community, Peace Trot organizer Tom Joyce worked with the Lehman Alternative Community School (LACS) during these late winter months to take a weekly run on Ithaca’s wonderful Cass Park and Waterfront Trails. I’ve joined the group for three of their weekly meetings, and they have been a courageous bunch, as anyone who runs in an Ithaca winter knows: coming home with soggy feet from the windswept expanses seems to be a given, and for those new to running, keeping an even pace for a few miles while facing the inevitable aches and pains of a new physical activity has taken real courage. Some of the best times we’ve had have been dividing into teams and running short relay races where we cheer each other on, allowing the creativity and supportiveness of the LACS community to shine through. As I am reminded of my own first experiences with running as a middle school student in Ithaca decades ago, a reflection/mantra on running as a microcosm of life comes to me: “we run to be together, we run to be outdoors, we run to look out for each other, we run because any run enlivens our bodies and our minds, we run to leave it all behind, we run to visit our communities, we run to overcome, we run to challenge each other.” Maybe you out there have your own phrase to add to this mantra as you take on your daily run, walk, bike ride, or other efforts in life. 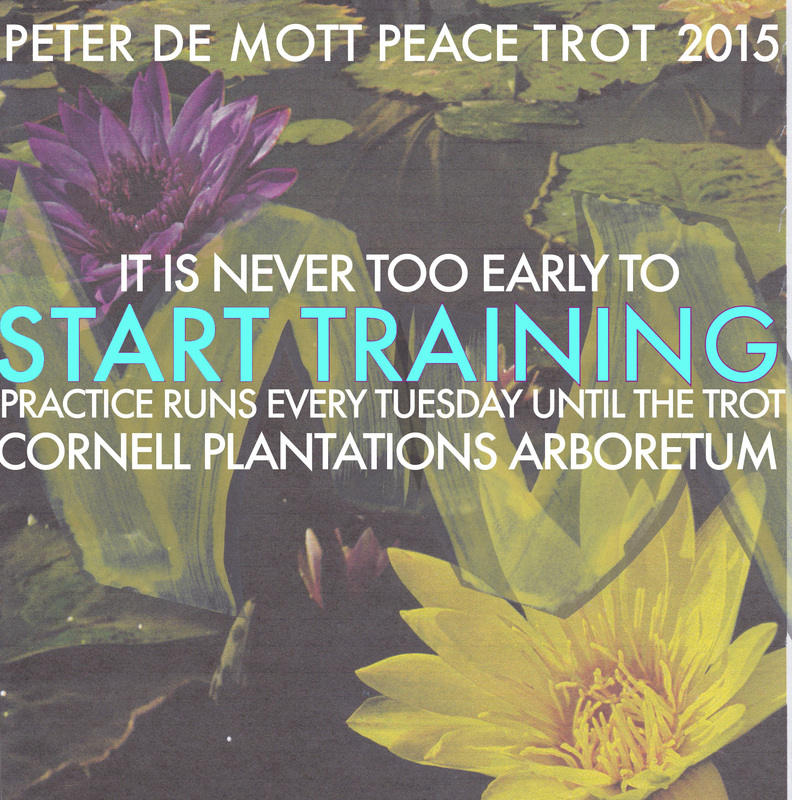 For me, the peace trot is celebration of this microcosm of life as running, refracted into the messages of peacemaking that Peter DeMott spoke for, and the Ithaca Catholic Workers and groups like them around the world continue to bring us. Thanks so much Tom for organizing this LACS group! Louie and I were talking about Peter the other day. I said at one point, “In the last eight years, he probably would have been arrested 10 times for acts calling for disarmament and world peace. And he would have spent 10 or 11 months in jail.” When I thought about this later, I thought yes that and he would have done a lot more. He would have loved his wife another eight years. He would have loved and supported his 4 daughters in many ways. He would have run a bunch more miles on this good earth. He would have performed another eight years worth of random acts of kindness. I, you and Joe Smoe would have been the recipients. Louie and I talk about Peter a lot partly because the three of us met at the same time. It happened to be on a car ride when four of us were to join a protest at the commissioning of a nuclear armed Trident submarine in Groton, Connecticut. We talked back and forth about what to expect. We knew that some people were planning to blockade the entrance to the shipyard where people would be going in to see the commissioning. It would be a blessing of the boat, breaking a bottle of champagne on the hull and all of that. We also knew that people going in had to have tickets. But we didn’t make any particular plans and actually had no idea what to expect the next day. As I was thinking about writing this piece, I read about someone that reminded me of Peter’s action that day. I’ll come back to that reading directly. Anyway, it turned out that on that day Peter enacted what was to become the 2nd in a long series of aptly named Ploughshares disarmament actions. He and Michael were given tickets to the ceremony and promptly joined the crowd inside. Louie and I joined the blockade of protestors at the entrance. There was no great plan. He seems to have just found himself someplace. And then he did what he did. It’s not completely unusual that we find ourselves somewhere or in some state of mind and that we act in the moment. For those of us guided and inspired by the Spirit, we’re not surprised or afraid of those moments. I mentioned earlier that I had just read about someone who reminded me of Peter. It is Feyisa Lilesa. Feyisa’s brother-in-law has been imprisoned for a year, reportedly having been tortured. His brother, Aduna Lilesa, also a runner, was beaten and detained by the Ethiopian military. As Feyisa crossed the finish line in Rio, he crossed his arms in clenched fists, the symbol of Orono resistance. Here’s the thing. Feyisa talked about the urgency he felt to make some protest gesture, but he told no one about an intention to do so. But when he got to the finish line he knew his moment had come. His wife, two children and dozens of relatives and friends, watching in Addis Ababa, went from cheering to stunned silence. They had no idea that he would do what he did. Fearful of going back to Ethiopia, Feyisa obtained a travel visa to come to the United States. His wife, Iftu Mulisa and two children Sora and Soko have finally been able to join them in mid February. He is currently training in Arizona for the April London marathon. The family hopes that he gets the green card that he has applied for. There aren't any tennis players insyria anymore. what's a fellow player to do? I suppose you could substitute any name for tennis player in this title– pianist, botanist, baby – and it will still be accurate. How do we separate someone’s misery in life from the next person’s misery? As I started reading about and researching tennis in Syria the last few years, I was struck by one story in particular. Aleppo is an ancient Syrian city not far from the capital of Damascus. Something of the center of sports in Syria, a new indoor tennis facility was built in Aleppo in 2008. The Syrian Davis Cup team began to use it as its training facility. The Davis Cup is one of the international competitions, separate from the more high profile professional tennis tours. It is a team competition with men’s, women’s and mixed competitions held around the world. Syria is relegated to the lower level of competition, apart from the sport’s powerhouse countries of Spain, Switzerland, Serbia, England, the U.S. and Australia, and more often competes against Sri Lanka, Turkmenistan and Iran. Anyway, last year one of the many anti-government militias launched a bombing attack against an Aleppo Syrian Army base. Stray bombs hit the tennis facility and blew it to smithereens. Oh well, nowhere to play tennis anymore. When I read that story, I immediately thought of the tennis courts in the city park across the street where I lived as a boy. That park and those tennis courts were a refuge for me. It was where I could always go and feel free of whatever bothered me – run around the perimeter sidewalk track, swing on a swing, smack a tennis ball as hard as I could, run down a ground ball and throw it to first base. Although our neighborhoods were blighted by racial tension and organized crime, if you had your wits about you as a boy, the park felt safe. Because I lived so close, I always felt safe in that park day or night. So I’m struck by the awful feeling – what would it have been like to have that park bombed, just a mistake in someone’s else mess, collateral damage in some bigger, incomprehensive conflict? The Syrian Davis Cup players, Amer Naow, Marc and Bruno Abdelnour, Kareem Allaf and Hasim Naow, are all refugees now. They are not the refugees that we’re hearing about, those desperate to get out of Syria to Turkey, from Turkey to Greece, from Greece to somewhere else. Because they are all from families of dual nationalities or of some financial means, they are living in Egypt, Canada, Lebanon or go to college here in the U.S. But they’re not where they grew up and they can’t walk down the street to play tennis where they could as a teenager. All of the Syrian refugees that we hear about have a story. Some are more dramatic than others. Some involve people on our side of the political spectrum. Some are on the other side. Maybe one of them is a tennis playing teenager whose tennis court in a park all of a sudden becomes the battleground between two factions in a civil war. And his mother had no choice but to leave their home and take him with her. The children in the little Quaker Meeting that I attend have been making hygiene kits for Syrian refugees. They solicited donations of various articles – toothbrushes, soap, etc. –and put together the kits. Now they are on their way to refuges somewhere in the world. It’s how I can help a fellow tennis player. Not much. Often that’s all we’re called or able to do. So there you have it. We have empathy when the horrors in the world seem like they could have could have been our life. Something tells us we should try to help. And then we do something to try to help. It could be anything. But we do something. Connor Nolan and Niall Hodges were both seniors at the Lehman Alternative Community School as we were preparing for the 2015 Peace Trot. They also ran on the IHS track and cross- country teams. For their senior project, they planned to do a series of 25 mile runs on succeeding days. That is, equaling a 100 mile run. Their intent was to do it along the Finger Lakes Trails ending at Buttermilk Falls, carrying their camping equipment as they go and camping out each night. It was one awesome project. Niall and Connor were first and fourth in the teenage boys division of the 2014 Peace Trot, Niall finishing second overall. Here is Connor’s brief account of their 100 mile run. So we ended up running over the course of 3 days (66 hours total) and finishing with a 45 stretch from Watkins Glen that took us all day and night. The point of a senior project is to take the most important and meaningful things that you have learned at LACS and apply them to a project that will demonstrate your learning and growth as an individual. We decided to do this because much like high school it required planning, hard work and perseverance to get through it. Our run also represented a risk that is taken in order to get to a better place in life in that the completion of our journey was certainly not guaranteed. I was inspired to run because of the growth that I have experienced running for IHS and I wanted to take it a step further. I like to compete against others but this was a new competition against myself and I was not sure I was going to win. In the end we felt amazing and would encourage anyone to go out and do the same because you will be changed mentally and emotionally for the better! I ran the 800 meter dash and Niall ran the steeple chase. Also we started in Bath NY at a community called PeaceWeavers and ran directly back to Eco Village. Amelia Kaufman, who ran in the Peace Trot in 2013 and had the fastest woman’s time, is an ultra distance runner. Also a student at the University of Vermont, she recently ran in a 100 mile. You’ve heard of the 100 meter dash; that’s not it. The 100 miler was in the mountainous ski resort area of Vermont near Pittsfield. The course was a 10 mile loop that the runners were to complete 10 times. Amelia reports that it was a very difficult course with even the descending trails having steep uphill sections. I’m going to let her give you more of the details, but just one – she and her running partner, Riley, ran for 28 hours, without stopping to sleep. Amelia reports that “I felt like I was going to fall asleep while I was running.” What exactly does it feel like to sleep while you are running? 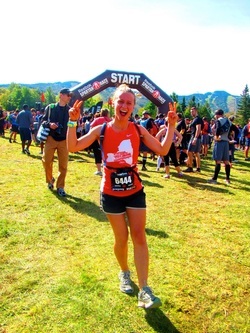 “I guess I started getting into the ultra-distances once I had run a couple marathons. At that point I knew I liked running and I knew I could go further. The idea of running 50 miles was just intriguing. Everyone knows what a marathon is and that it's a long way, but I was intrigued by this subculture of ultra-runners that took running beyond the marathon. The idea of running two marathons at once instead of just one was captivating and I wanted to do it. It seemed like such a great challenge and of course, a great accomplishment. Once I have in my mind that I'm going to do one of these ultra events, I just accept that it's going to be hard but that I can do it. I try not to over think it because thinking can sometimes get you into trouble. I try to have a "just go for it!" mentality. The "First" day of Spring wasn't really the first day of Spring. Nonetheless, three of us, Blake, Oona and Tom, got out there and ran part of the Peace Trot course. That is, we ran most of the roadway, because the rest of the route is still buried in snow. It was really surprising how little the snow has melted in that little microclimate of the Arboretum. Here is a little something that will cheer you up. We ran "most of the roadway" because that little steep hill near the end of the road race course was coated with 3-4 inches of ice. And we couldn't run up it even if we wanted to! Running outside in the early "Spring" does have its challenges, which can be the subject for a longer reflection. 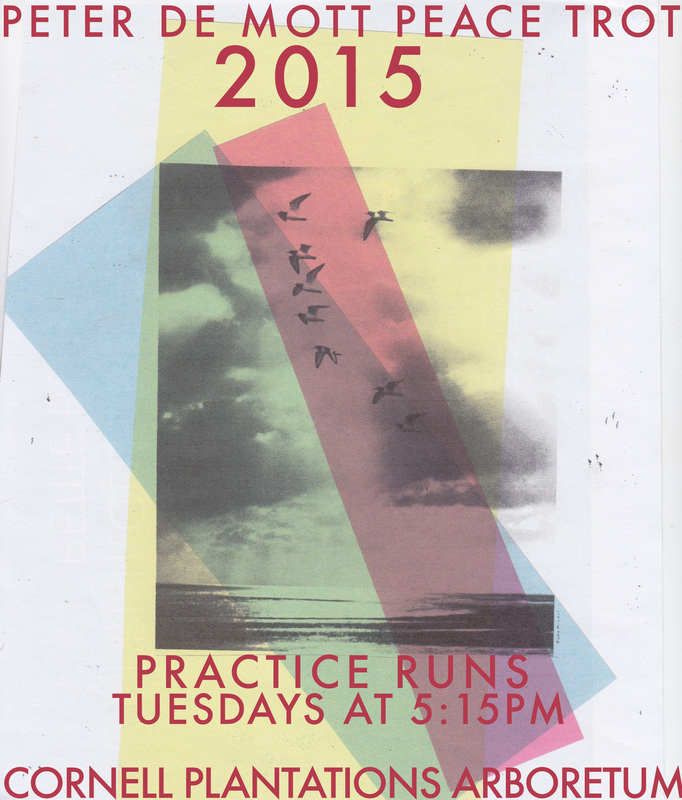 But we did keep running and have decided on Tuesdays from now until the Peace Trot, starting March 24, 5:15pm. If the Arboretum roadway is closed to traffic as it was on Friday, we will meet at the Forest Home Drive parking area along the creek at the bottom of the Arboretum across from the greenhouses. Questions? Call Tom at 607-277-7426 or email peacetrot@gmail.com. Keep up to date on our website (www.peterdemottpeacetrot.org) and Facebook page (www.facebook.com/PeaceTrot).